This is one of those dishes where (in my opinion) the bell peppers spoil the entire thing. 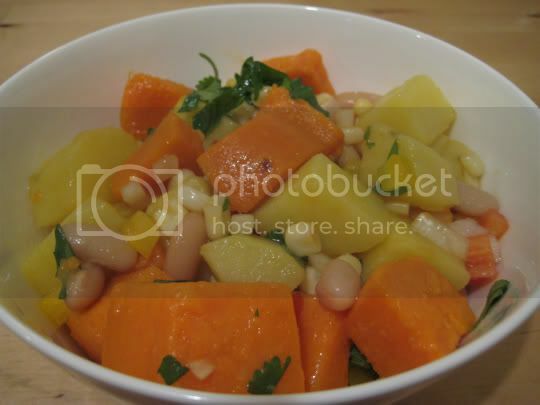 I was really looking forward to tasting this recipe, with its combination of sweet potatoes, yams, beans, corn, cilantro, and onions (and red AND yellow bell peppers), tossed in a vinegar, mustard, sugar dressing. The tangy and the sweet I knew would just be amazing. And then I tasted it, and then I was overwhelmed by the bell peppers...even though there wasn't that much added (you canbarely even see them in the pic). But, I was able to eat it the first day. Move to the next day, where the bell pepper flavor seemed even stronger. I couldn't even eat it! So alas, this was quite a surprising failed recipe. I couldn't find (okay, I didn't even bother trying) any purple swet potatoes (who knew the things even existed? ), and I didn't want to substitute purple potatoes for a "less sweet dish" as suggested...so I just used one yam and one sweet potato (I did halve the recipe). And maybe that was another problem...this dish seemed entirely too sweet to eat on its own. It definitely needs to be paired with something savory or spicy...maybe a jerk tofu or something if we're keeping with the Caribbean theme. And eating yams and sweet potatoes together, expect a very starchy meal. Make again? This recipe definitely deserves one more shot, omitting the bell peppers of course.